Royal Praline Company, French Quarter, New Orleans, Louisiana, 2012 - What Happens in New Orleans stays in New Orleans! Some more way overdue photos from my trip to New Orleans for the inaugral year of the Niche Mommy Blogging Conference in New Orleans in 2012! (My New Orleans Wordless Wednesday Series got seriously interrupted so I promise I'll get them through all, at least before #NicheMommy13 that is!) 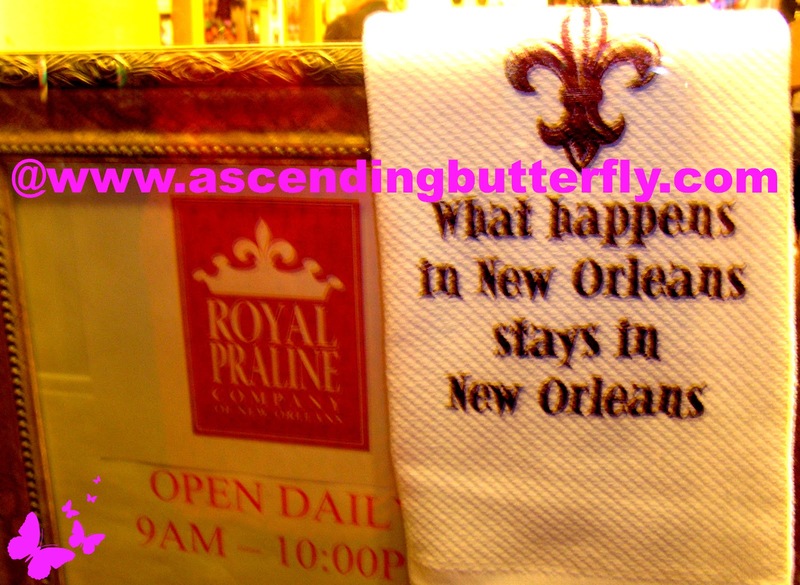 I definitely hope it's true that What Happens in New Orleans stays in New Orleans! LOL (as well as Vegas and Atlantic City, Just Saying!) I'm glad that the Royal Praline Company agreed with us! I regret not buying that towel when I had the chance! 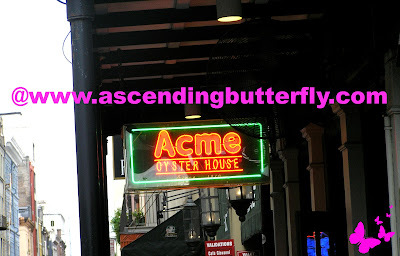 Acme Oyster House, New Orleans, Louisiana, 2012 - Prepare for super long lines to get in, but the food is THAT worth it! Char-Grilled Oysters at Acme Oyster House, French Quarter, New Orleans, Louisiana, 2012 - We ordered one to share, and boy was that a mistake, everyone ended up ordering their very own order of these, they are so good. The long lines were worth it, seriously just for THIS!!!! The sauce (let it cool a bit) will make you want to lick each of your fingers for the stuff that stuck to your fingers besides the bread. So delicious they are almost sinful! and I mean that in a GOOD way! :) Oyster Nirvana can be found at Acme Oyster House! The Char-Grilled Oysters were a HUGE hit, let's just say that quite a few of these platters were ordered to share! And sadly when you leave NOLA, you will see these and taste these in your dreams, your taste buds will salivate at the sheer thought of them! This will be my first stop when I go back to New Orleans! Bloggers feel free to comment with your Wordless Wednesday links, we are not formal enough for an official Linky Widget around here, so just join in the fun, get laid back, and most of all, get Wordless (someday I promise I'll keep it entirely wordless). FTC Disclosure: This is NOT a sponsored, this is a recap of my experiences during my visit last year to New Orleans for the Niche Mommy Blogging Conference in it's inaugral year. I was sponsored by Britax as a member of their Latina Digital Advisory Board and Latina Hispanic Outreach Blogger and Brand Ambassador. No Monetary Compensation has been received for sharing my experiences at the conference. Oh my heavens! Yet one more thing to make me NOLA sick on thus snowy, cold morning. You aren't kidding when you say the food is amazeballs! We had a great time!! Good Food - Good Company!! Oh my !! 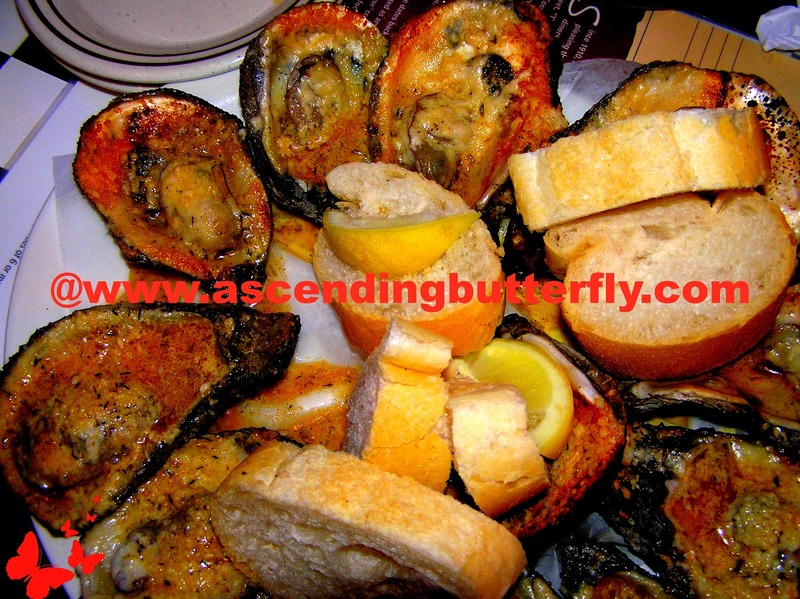 Those oysters look so yummy just one more reson to go to nola! @Jennifer - Happy New Year to you also! I definitely do (both of) the Wordless Wednesday hops! mmmm. might have to try those oysters! @HereBeDragons - The Chargrilled are the BEST I've tried so far, and that includes trips to the Caribbean as well as the infamous Dock's Oyster House, ACME Oyster House in New Orleans is very much high on my list!